A nightclub has escaped serious sanction after customers were sold laughing gas. 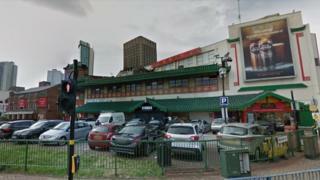 Stories in Birmingham came "very close" to having its licence suspended, but was issued an "informal warning". Police had called for a licence review after witnessing nitrous oxide being sold from balloons for £5 each on Boxing Day last year. A barrister for the club's bosses said they "didn't particularly appreciate that it was contravening any law". Addressing the Birmingham City Council meeting on Monday, PC Ben Reader, of West Midlands Police, said it was not something the force had seen before, the Local Democracy Reporting Service said. A report, submitted by the council's public health department, also highlighted the side effects of nitrous oxide, which include dizziness, nausea and nerve damage. She said they had not been aware it had been outlawed by the Psychoactive Substances Act 2016. Councillor Barbara Dring, chair of the committee, said "ignorance was no defence in law". "As a responsible premises licence holder and designated premises supervisor it was their collective responsibility to ensure the licensing objectives were properly promoted to prevent crime and disorder and promote public safety, although the ultimate responsibility rests with the holder of the licence," she said. How dangerous is laughing gas?